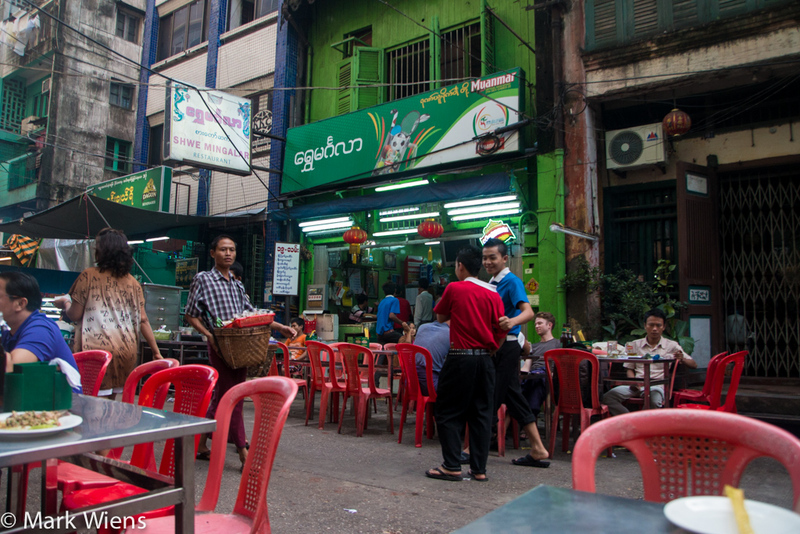 When you’re in Yangon and searching for places to eat, you’ll likely come across Yangon’s famous 19th Street in the Chinatown area of downtown. 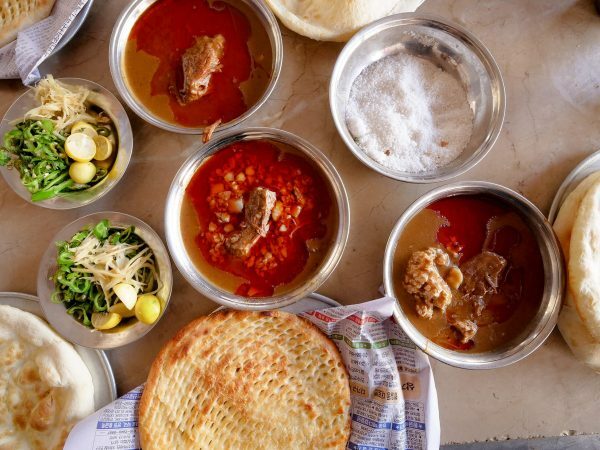 Every evening, the main street of Maha Bundala comes alive with vendors of all kinds, selling all sorts of edible foods, ranging from Chinese to local Myanmar dishes. If you make a turn down 19th Street, all of a sudden the chaotic take-away street food style stalls that fill the sides of the main road, become a little more relaxed, and there are a number of restaurants which have full-sized tables and chairs (not the typical miniature plastic chairs) to sit at. It’s a well known area of town and even recommended in the NY Times 36 hours itinerary for things to do when you’re in Yangon. 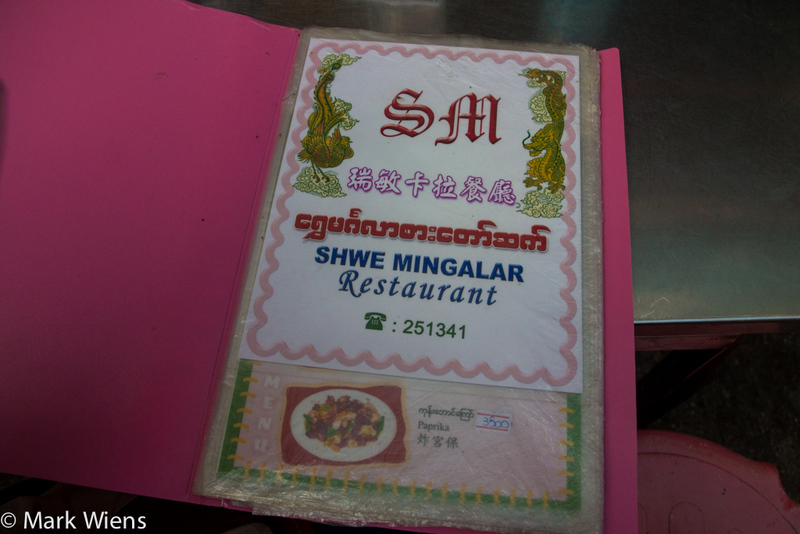 By little more than having a nice table available, and a beautiful looking cabinet of fresh skewers, Ying and I decided to sit down at a restaurant by the name of Shwe Mingalar Restaurant. The first line of order, as soon as you find an open table, is to head to the glass and steel cabinet. 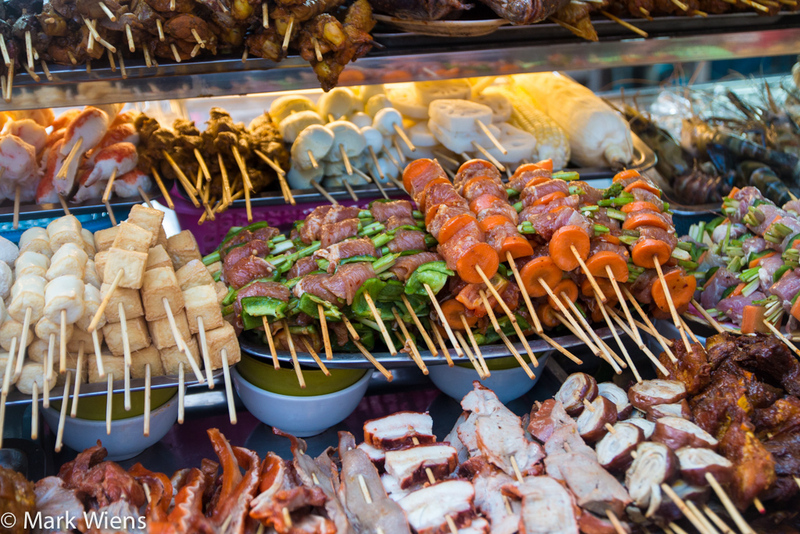 Most of the items on skewers you should recognize, just about everything is pretty familiar – there’s pork, chicken, meatballs, tofu, ribs, squid, prawns, and then mushrooms, broccoli, carrots, asparagus, and plenty of other things too. 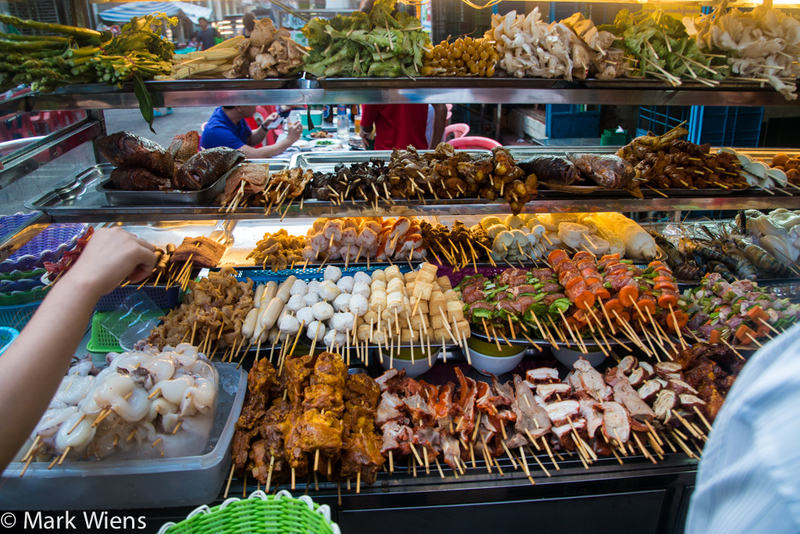 I didn’t ask too many questions, but just started pointing to a few of the skewers, to which the kind lady assisting me immediately placed them in a basket. Some of the meats looked pre-cooked already, so I mostly strayed away from those and stuck with raw meats and a few skewers of vegetables. Some of the meat on the skewers looked like it had been marinated and seasoned already, while others skewers looked almost completely plain, especially the vegetables. 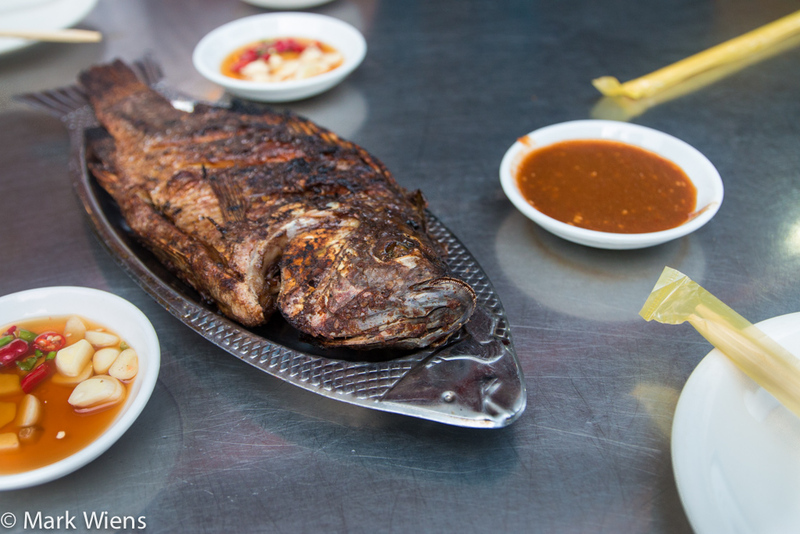 One thing I wasn’t going to miss was a barbecue fish. I remember on my previous visit to Yangon back in 2011, I had fish on 19th Street a number of times (I believe for 3 dinners in a row), to fill up on protein. 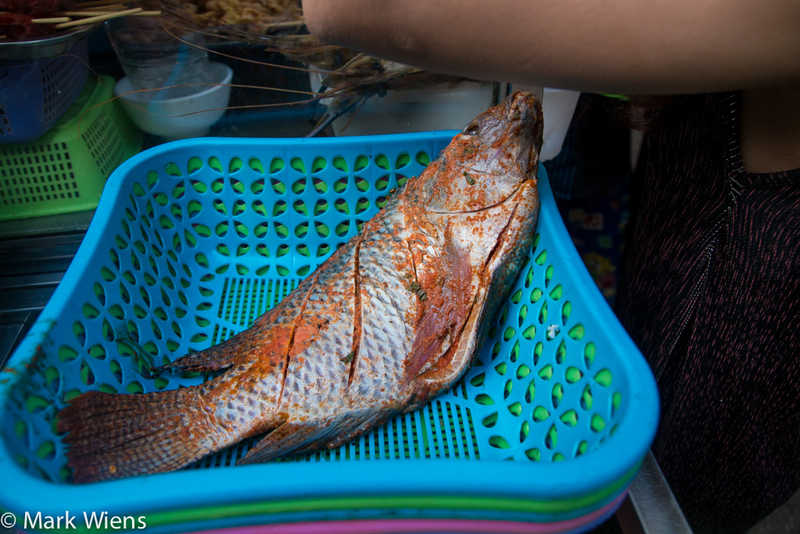 The fish was beautifully rubbed in a marinade of red chili paste and a few extra spices. 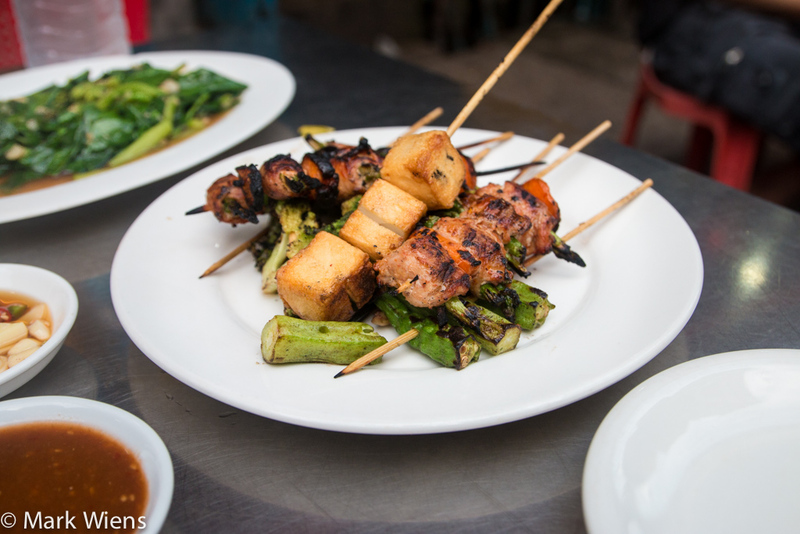 Keep in mind when you’re choosing skewers of barbecue on 19th Street in Yangon, that some of the restaurants also have a full menu, mostly of Chinese dishes (but you might need to ask for the menu). 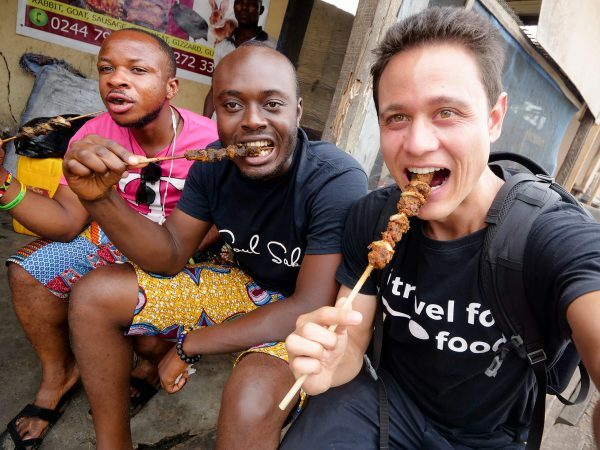 So you could choose to just rely on barbecue skewers, or you have the option of supplementing your meal with some other types of dishes as well. I decided to order a couple side dishes, kailan stir fried with oyster sauce, and fried shrimp. After you’ve done your ordering, it’s time to just sit back, and enjoy the atmosphere of Yangon. 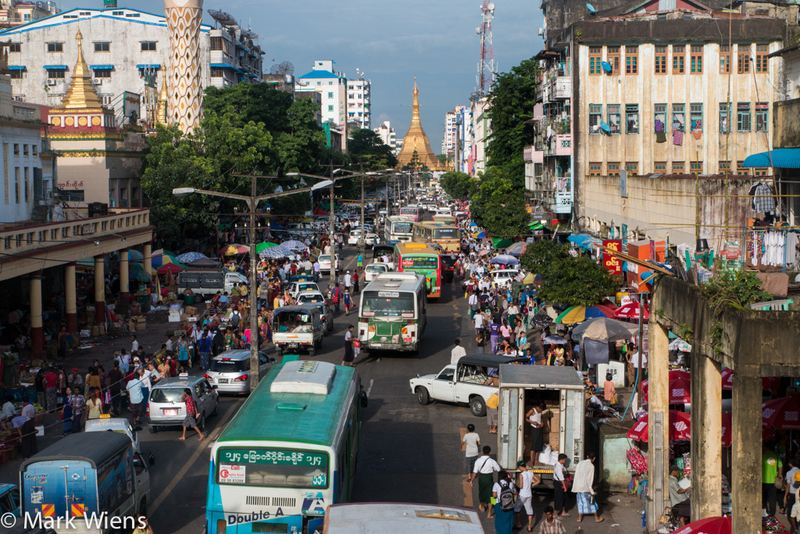 Despite 19th Street being a side street, and away from the main action of Maha Bundala, it’s still Yangon, and it’s still always busy and interesting. Most of the people that wander down the street are hunting for barbecue and food, but there are occasionally trucks and vehicles that squeeze through the street (don’t get hit!). 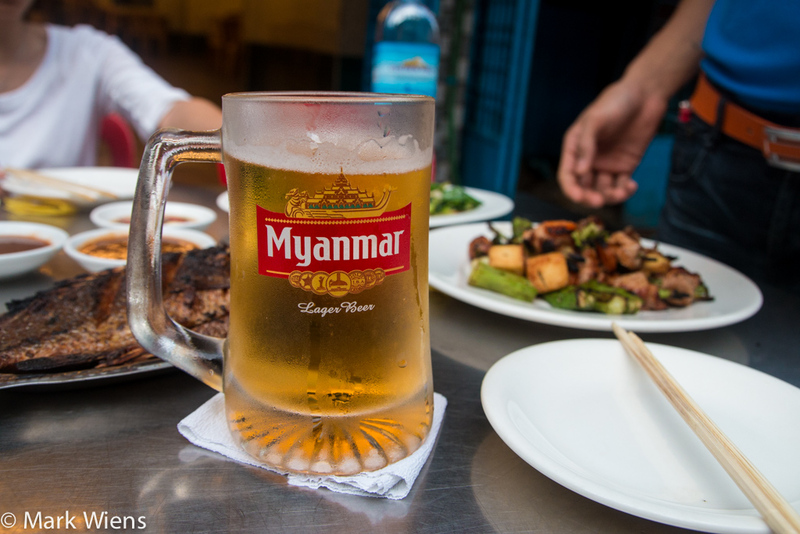 A cold Myanmar beer is quite a refreshing addition to a Yangon street food meal on 19th Street. The first dish to arrive was the fish, this time a little more blackened than when I had previously seen him! 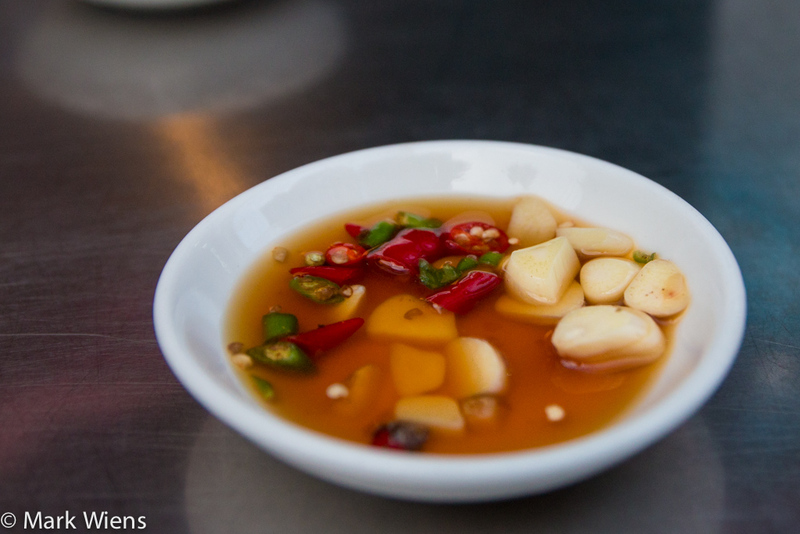 It was served with a light tomatoey chili sauce, and a also a side of fish sauce with garlic and chilies (just like Thai prik nam pla). Then came the rest of the skewers, all barbecued up, and everything slightly blackened on the edges. I got a few skewers of pork stuffed with asparagus, but other than that, I mostly chose vegetables, as I had known I wanted to eat a fish. In just a few more minutes, our remaining dishes arrived, and we were ready to start digging in to our feast on 19th Street. 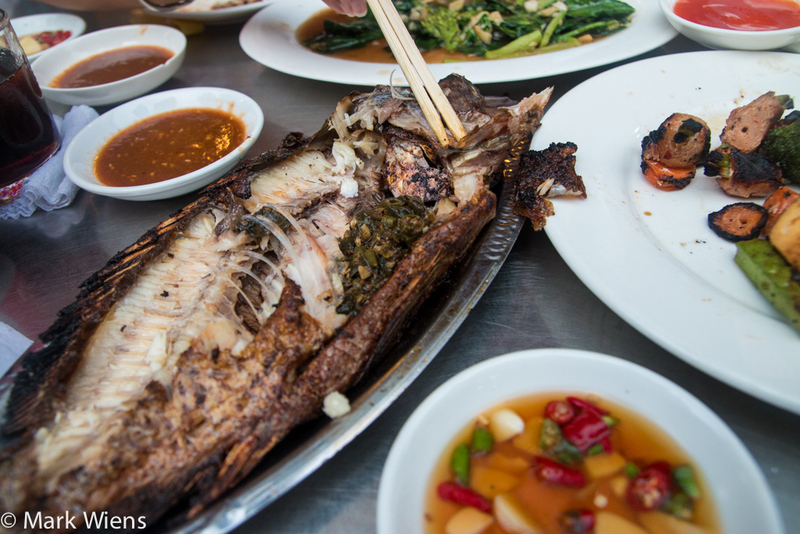 I really liked the marinade and seasoning on the fish – it was stuffed with what looked like green chilies and maybe ginger, plus some other herbs, and it was rubbed in a red chili paste. But unfortunately the fish this time round was overcooked; It was quite dry and lacked the flakiness that normally comes with a tilapia like this. Nevertheless, I did enjoy it, and the flavor was tasty. The other skewers, which the waiter kindly took off the sticks (could I say, de-sticked, or de-stuck?) for us, were a little over barbecued. But despite having to cut off some of the black charcoal edges, all the ingredients tasted great. The vegetables were mostly plain, perhaps seasoned with a bit of salt, and the meat was seasoned with salt and chili. 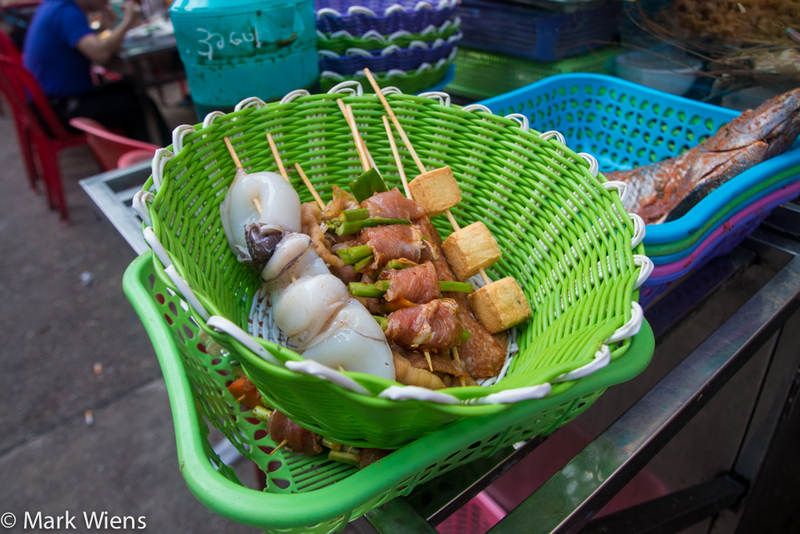 They weren’t quite the juicy goodness of those skewers in Tokyo (then again, they weren’t quite the price either). Probably my favorite items on the plate were the roasted broccoli and the asparagus wrapped in pork. Both the dishes that I ordered off the menu, the stir fried kailan (Chinese broccoli) and the deep fried shrimp, were excellent. The kailan was stir fried with a load of garlic, so it had a wonderful fragrance to it, and the shrimp were breaded and then deep fried to a crisp. 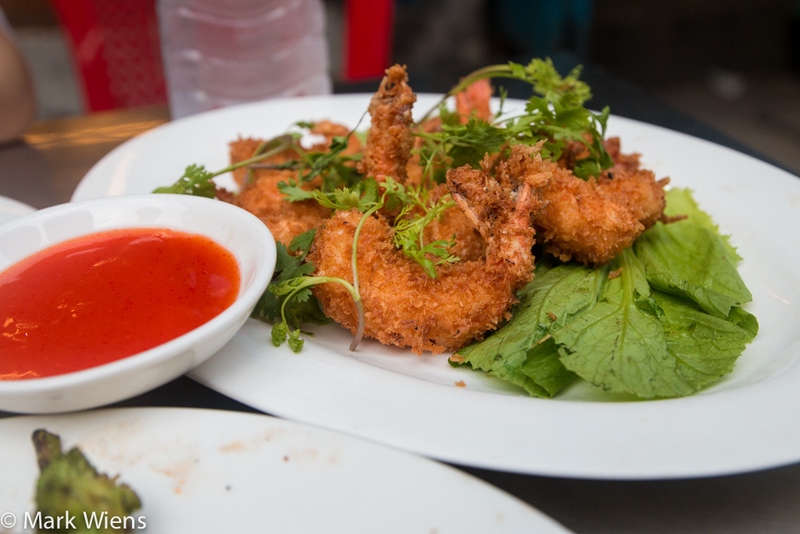 The shrimps were nice and moist and not overcooked on the inside and so crispy on the outside. I would imagine that this restaurant we ate at has pretty similar prices to most of the other restaurants on 19th Street. 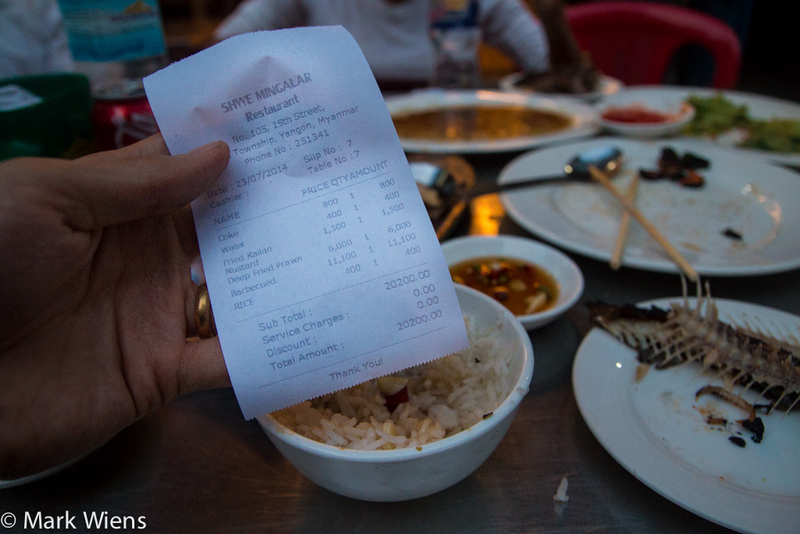 Our total bill for everything came to 20,200 Kyat – $20.42 (the barbecue we ordered was 11,100 Kyat – $11.22). I didn’t even examine the bill closely while we paid, but looking at the photo of my receipt now, did they forget to add my beer? Or was it a complementary beverage with the amount of food we ordered? Anyway, prices are more expensive than many other restaurants in Yangon, but then again, you do get more protein. I think about $10 per person is a good budget for a big meal on 19th Street. 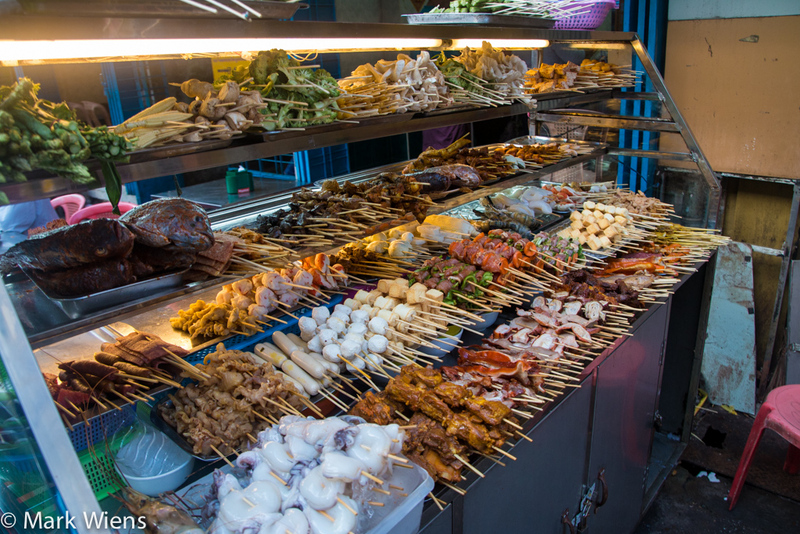 19th Street in Yangon is known as barbecue street, a road that’s home to a number of restaurants that serve Myanmar Chinese style barbecue on stick. 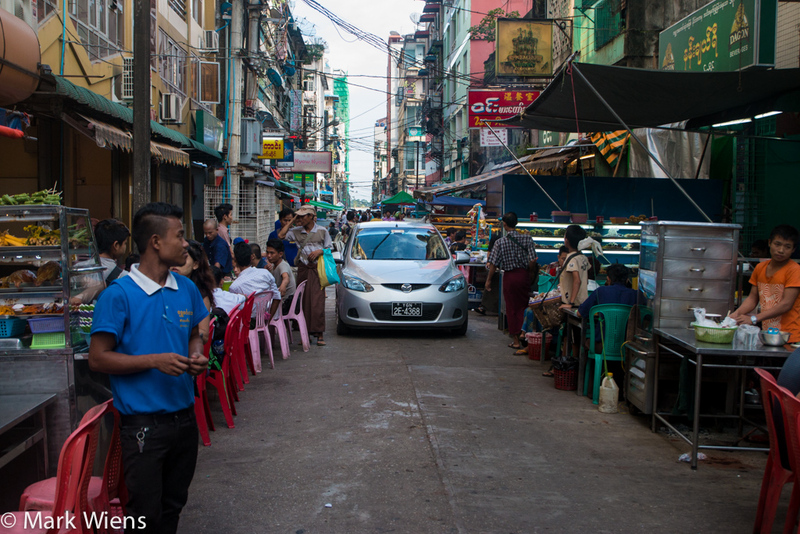 The street is lively and busy, but at the same time it’s a relaxing break from the action of the bigger street and markets of Yangon. 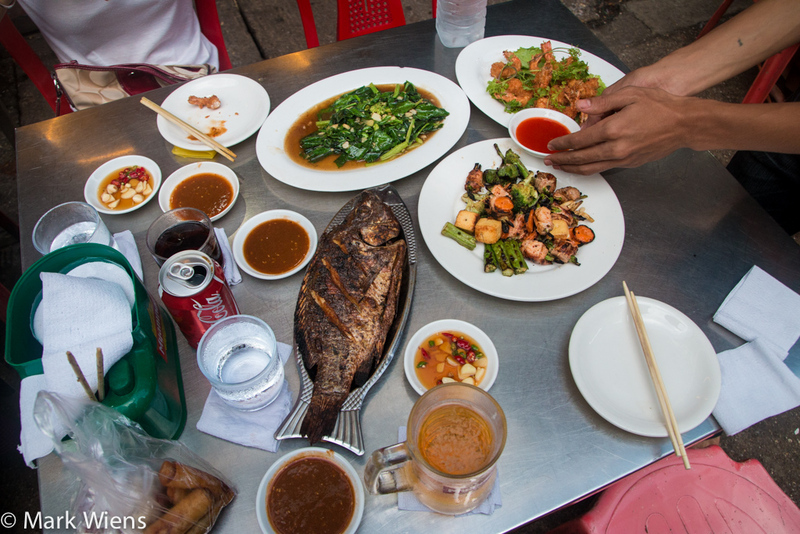 The restaurants along 19th Street make a good place to eat some barbecue, drink a beer, and enjoy the outdoor atmosphere of Yangon (video). Address: No. 105 19th Street, Yangon, Myanmar (the restaurant is about 100 meters down the 19th street from Maha Bundala, and it occupies both sides of the street). How to get there: 19th Street is of course located right on 19th Street in downtown Yangon (which happens to be set up in quite an organized grid of streets). Access 19th Street from Maha Bundala (the main road that leads directly to Sule Pagoda). It’s about a 15 minute walk from Sule Pagoda. Hi! Mark, I am planning to visit Burma in end October. If time permits I would like to visit 19th street. Hey Anika, great to hear from you, and that’s awesome that you’ll be in Yangon for 6 months. Glad you enjoyed it! Many thanks, will certainly visit Chinatown and that restaurant. What camera were you using? Those are ultra-clear crisp shots! Oops! My answer had been answered above. Sorry about that. Love your travel pictures Mark. Keep up the great work. What camera equipment are you currently using for your still photos? Hi RC, thank you very much. I’m using a Canon 70D normally with a Tamron 17-50 mm lens. 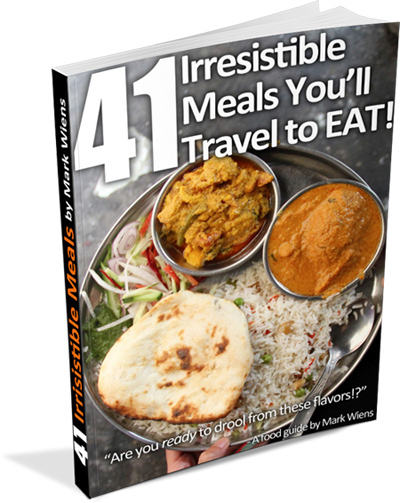 Fantastic post – more appetizing than the raw pig’s blood, at least! Cheers. Looks like there are plenty of option types of food. No better way but to wash it down with a beer or two. Hey De’Jav, yes many different kinds of food available. 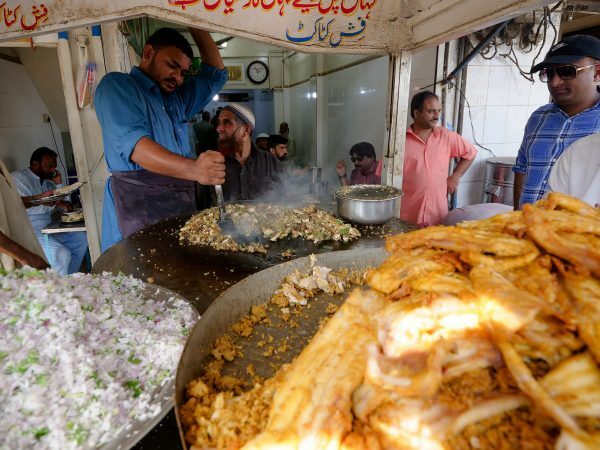 Great “food street”, I was there last year after watching Anthony Bourdains Parts Unknown. 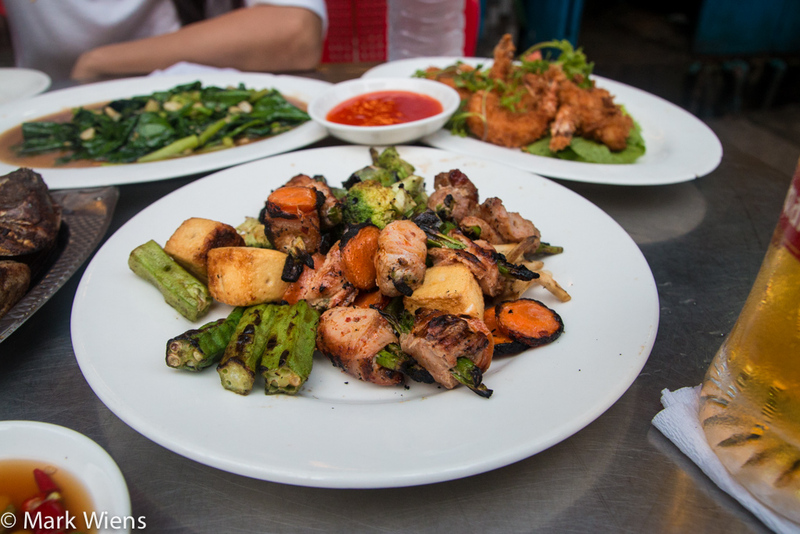 Besides the BBQ-skewers don’t sleep on Fried Spicy Tofu. Great to hear that you enjoyed the BBQ street. I didn’t get to try the fried spicy tofu, how was it? I haven’t been to Burma yet, but this part of Yangon will be topping my list when I get back to Southeast Asia next winter! Hey Frank, great to hear that, I think you’ll enjoy Burma! “could I say, de-sticked, or de-stuck?” – I have seen the use of ‘de-skewered’. It’s my word of the day! Hey Mark, that’s the word I was looking for, thanks!